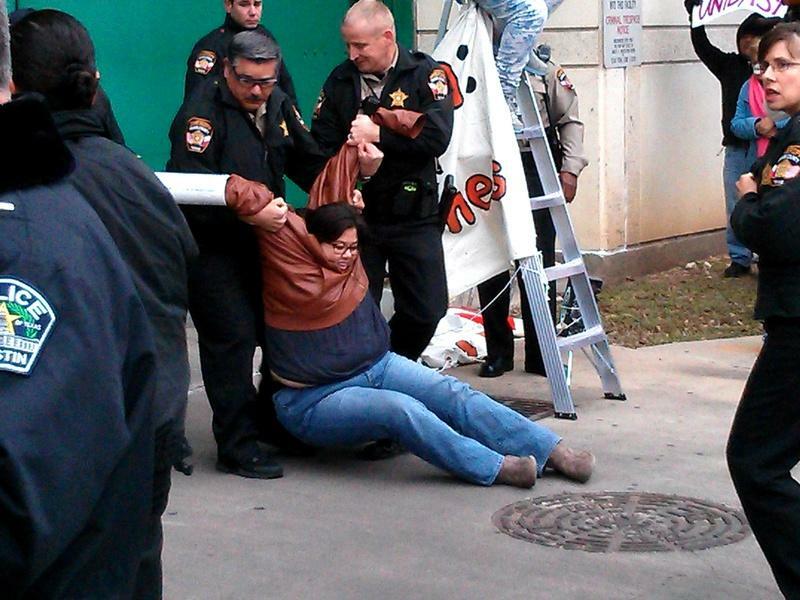 Cristina Parker gets arrested during a protest against the Secure Communities program. Travis County sheriff’s deputies on Monday saw firsthand what immigration-reform activists hope will be a series of civil disobedience protests across Texas. As part of a publicity campaign, a group of six activists blocked the exit gate at the Travis County Jail; they were arrested and will likely be charged with criminal trespass. The protesters hope the actions will prompt county officials to reconsider a controversial finger-printing initiative opponents say deports non-violent undocumented immigrants. Under the Secure Communities program, administered by Immigration and Customs Enforcement, officers compare the fingerprints of people they arrest to a federal database to determine if the arrestees are eligible for deportation under federal immigration laws. Travis County Sheriff Greg Hamilton, a Democrat, said during his 2012 reelection campaign that his agency is merely enforcing current law. Cristina Parker, the immigration project's coordinator for Grassroots Leadership, said the event, part of a national movement called 'Not One More,' was aimed at influencing immigration policy across the country. Getting arrested is to be expected, she said. Previous immigration protests across the country have included undocumented immigrants who knowingly risk being taken into custody and possibly deported. Parker said none of the protesters on Monday were undocumented, but said the risk taken by organizers and activists shows unity within the reform movement. Minutes later Travis County sheriffs’ deputies were hauling her off for booking. The Travis County Jail averages about 19 deportations per week, according to event organizers, which they say is one of the highest rates in the country. “The criminalization of our immigrant community must stop. When our local police force focuses on detaining and deporting non-criminal hardworking members of our community, they are not only separating families, they are also diverting time and financial resources from addressing real dangerous crime,” Alejandro Caceres, the executive director of the Austin Immigrant Rights Coalition, said in a statement. Travis County officers and the Austin Police Department said the protesters would likely be charged with criminal trespass, a class C misdemeanor. They declined to comment on the event or on Secure Communities. The protest came just three days after congressional Republicans unveiled their guidelines for immigration reform. Unlike a proposal passed by the U.S. Senate in June, the GOP’s plan does not include a path to citizenship for most immigrants. Before being arrested, Parker said that she wasn’t too impressed with the guidelines, which also require more border enforcement. But her group’s mission will now focus on what Monday’s event was supposed to highlight.